A total of 36 rockets were fired towards Israel from Gaza on Wednesday, four of which were intercepted by the Iron Dome missile defense system, the Israeli military said. At least one person was injured and taken to hospital. 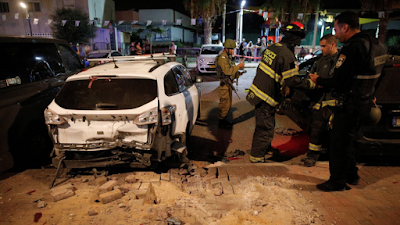 Pieces of two missiles landed in the southern Israeli city of Sderot, eyewitnesses told local media. A police spokesman confirmed that reports were received about two projectiles which fell in the city, according to The Jerusalem Post. Two separate homes were reportedly hit by shrapnel after the interception. Video footage posted online by the IDF shows a rocket flying through the sky. Schoolchildren can be heard screaming in the background. Other photos appear to show damage to a car and an apartment complex, and smoke rising from a house. A 34-year-old man was reportedly wounded by glass shards during the attack. He suffered light to moderate injuries and was taken to Barzilai Medical Center, according to Haaretz. Another man in his 20s was also lightly wounded and taken to the same hospital, The Times of Israel reported. Following the launches, an Israeli drone struck farmlands near Beit Lahia in the northern Gaza Strip, according to the Hamas-linked Palestinian Information Center. No injuries were reported. The rocket launches come after an IDF tank struck a Hamas facility in Gaza on Tuesday, reportedly killing two members of Hamas’ military wing’s al-Nukhba elite unit and wounding six others. The IDF later suggested the incident was a misunderstanding, as the tank returned fire in response to the shots fired as part of a ceremony of the al-Qassam Brigades, which were not deliberately aimed at Israeli soldiers, Haaretz reported. On Wednesday, an IDF tank again struck Hamas posts in Gaza after gunmen opened fire at a civilian vehicle involved in the construction of a barrier along the border. No injuries were reported as a result of the gunfire.